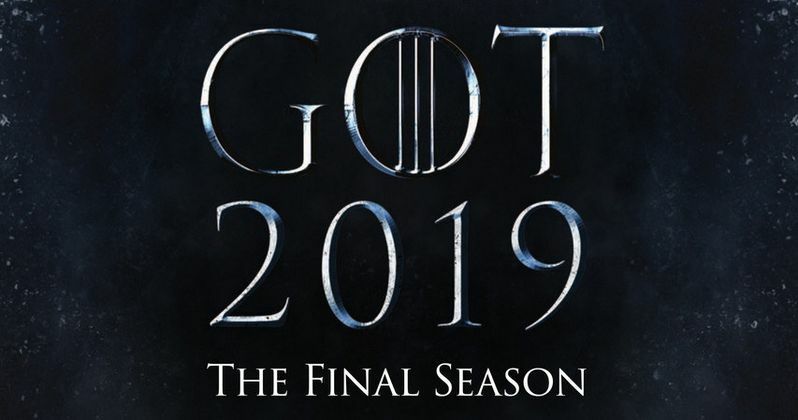 This year will be a rough one for Game of Thrones fans, the first since the series debuted on HBO where an entire calendar year will pass without new episodes. Production is still well under way on the final season, and while it remains to be seen when we may see the first footage from this highly-anticipated season, a new promo poster has surfaced, which will be showcased at the Licensing Expo in a few months. Unfortunately, this poster doesn't offer any new imagery for this final season, but it does confirm, once again, that this final season will debut sometime in 2019. Aside from the GoT logo, the poster also features smaller versions of the sigils for the three primary houses that will be battling for the Iron Throne in this final season, House Stark, House Targaryen and House Lannister. While House Targaryen currently sits on the throne in King's Landing, with Cersei Lannister (Lena Headey) taking over the crown at the end of Season 6, when her son King Joffrey (Dean-Charles Chapman) took his own life, that may not be the case when it comes to the end of the final season, especially if the Stark's and the Targaryen's catch wind of what Cersei is truly planning. At the end of Season 7, Daenerys Targaryen (Emilia Clarke), Jon Snow (Kit Harington) and Tyrion Lannister (Peter Dinklage) met with Queen Cersei in King's Landing, offering proof that the white walkers, which were often dismissed by those in the "south" as nothing more than fairy tale creatures, actually do exist. The long journey was made in hopes that Cersei would finally see the threat that the white walkers and their leader the Night King pose to all of Westeros, and it seemed to go well, with Cersei pledging to help the Stark's and Targaryen's fight off the Night King's army in the north, although she revealed later to her brother Jaime that she has no such plans to help them. Instead, she tasked Euron Greyjoy, who pretended to be terrified of the white walkers and claimed to be sailing back to the Iron Islands, with bringing the mercenaries known as the Golden Company to Westeros. The Golden Company has been mentioned several times throughout the show's first seven seasons, but this eighth and final season will be the first time we'll get to see these soldiers of fortune on the show. The show has cast Into the Badlands star Marc Rissmann to play Harry Strickland, the leader of the Golden Company, who Cersei wants to head north after the battle has ended and "clean up." There was also a set video that surfaced earlier this month that seemingly revealed a massive spoiler for the upcoming season, showing one of the sets in Ireland that was built as the Winterfell set, completely engulfed in flames. The video, which was taken from a road overlooking the set, didn't reveal much else aside from the sets being set ablaze, and it isn't known if the remaining members of the Stark family were in Winterfell when the city fell, or if they survived. While we wait for new details about the final season, take a look at this poster below.